Brothers Paul Van Doren and Jim Van Doren along with partners Gordon Lee and Serge Delia open The Van Doren Rubber Company, Anaheim, Calif., for business on March 16. Vans #44 deck shoes, now known as the Authentic, are born. Skateboarders who like Vans’ rugged make-up and sticky sole are seen sporting Vans all over Southern California. The Vans #95, now known as the Era, with a padded collar and different color combinations, is designed by Tony Alva and Stacy Peralta and becomes the shoe of choice for a generation of skateboarders. Vans’ “Off the Wall” logo makes its debut. Vans #36, the Old Skool, debuts with the now famous Vans Sidestripe. The Old Skool is Vans’ first skate shoe that incorporated leather panels for increased durability. What started as a random doodle by Paul Van Doren was originally referred to as the “jazz stripe” and has become the unmistakable hallmark of the Vans brand. The Vans #98 is also introduced and with the help of skateboarders and BMX riders, Vans Classic Slip-Ons become the rage in Southern California and will come to be the original Slip-On silhouette that will be known as an icon for generations. The Sk8-Hi, was introduced in 1978 as "Style 38", and showcased the now-iconic Vans Sidestripe on yet another innovative silhouette. The Sk8-Hi took skate functionality to the next level—above the ankle, where skateboarders used and abused their lower extremities the most. The Sk8-Hi not only protected bones from skateboards catapulted at them but also brought a whole new look to the park. The instantly recognizable checkerboard pattern became an icon over night. The Vans Steve Caballero, the first signature skate shoe, is introduced. The Half Cabwent on to become one of the most iconic and culturally significant shoes in the history of skateboarding. Vans brings the Warped Tour to the main-stage for the first time. Vans sponsors the inaugural Triple Crown of Skateboarding. Vans assists with the production of “Dogtown and Z-Boys”, Stacy Peralta’s look at the beginnings of skateboarding and the personalities that evolved the sport. The film takes the Audience Award and Best Director Award at the Sundance Film Festival. 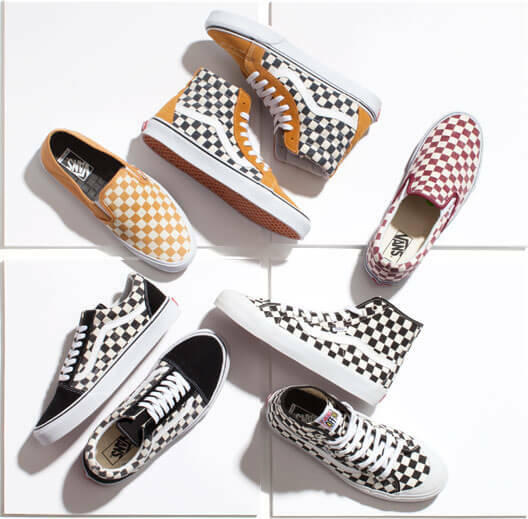 Vans launches the Vault by Vans collection, an offering of timeless footwear melding the worlds of high-fashion and premium design to Vans’ classic silhouettes. Today, Vault by Vans continues to forge innovative partnerships, with past collaborators including fashion giants such as Marc Jacobs, and contemporary artist Takashi. Harry N. Abrams publishes “Vans: Off the Wall, Stories of Sole from Vans Originals” which recounts the story of the many action sports legends, artists and musicians who have helped shape Vans as an icon of California culture. The 50th anniversary sees the book reissued with new chapters and a limited edition cover, available to buy now. Vans opens the House of Vans Brooklyn, skate and event space in New York with music by Public Enemy and a hard charging bowl session headlined by skate legends Tony Alva,Steve Caballero and Omar Hassan. Vans releases its first-ever surf film, ‘Get-N Classic, Vol. 1’ featuring the Gudauskas brothers, Pat and Dane, Joel Tudor, John Florence and the rest of the Vans surf team. Vans surf team is firing on all cylinders with the addition of the team’s first Australian in Wade Goodall and one of the most exciting surfers in the world, Dane Reynolds. Following the success of Get-N Classic, Vol. 2 and Vol. 3 followed, continuing to document the adventures of the Vans Surf Team across the globe. Vans introduces the first vulcanized cupsole. The new WAFFLECUP™ technology combines the best of both worlds with the support and durability of a cupsole and the superior boardfeel and grip of the traditional Vans vulcanized shoe. Vans celebrates 20 years of snowboarding heritage with the debut of its retrospective film Twenty Years: Off the Wall, On the Snow, produced in partnership with Mike Hatchett, legendary filmmaker and founder of Standard Films. 3,000sqm art, music and skate space under Waterloo station opens in London’s creative playground. Representing the eclectic diversity of London and the cultures that have embraced Vans from its humble beginnings, through five decades, House of Vans opens with a showcase of creativity. In May 2015, Vans makes skateboarding history with the highly anticipated launch of PROPELLER: A Vans Skateboarding Video, Vans' first-ever skateboarding film. This momentous occasion saw valuable international exposure for the Vans Pro Skate Team and even more global recognition for Vans' storied legacy in skateboarding. PROPELLER becomes one of the fastest-selling skate films to ever hit iTunes. Duke Kahanamoku helped spread surfing throughout the world. This Hawaiian surf legend, actor, and five-time Olympic medalist handed Vans founder, Paul Van Doren, the shirt off his back to make custom shoes. The Authentic Pro ’66 celebrates Duke’s iconic Aloha print and his legendary meeting with Paul Van Doren. As one of the original members of the ’70s Z-Boys skateboard team, Peggy Oki revolutionized the sport alongside other skate pioneers, including Stacy Peralta and Tony Alva. The Authentic Pro ’74 commemorates the Zephyr team’s explosion into the skateboard scene at the 1974 Del Mar Classic. An original Z-Boy, filmmaker, and co-founder of Powell Peralta Skateboards, Stacy Peralta brought his skate expertise into the design of Vans’ classic Era style in 1976. The Era Pro ’76 combines nextgeneration function with the classic style of the first-ever Vans “Off the Wall” shoe. One of the most innovative skateboarders of all time, Tony Alva brought his brash, aggressive influence and ideas to create modern skate culture. The Mid Skool ’79 continues what T.A. started—skater-driven design built for progression. Vans’ most iconic style was introduced to the world in Fast Times at Ridgemont High. 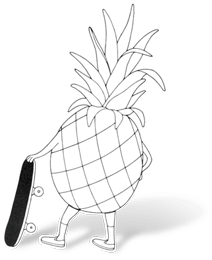 California’s youth culture, along with the Classic Slip-On, became a widespread phenomenon thanks to a surfer and his kicks. Jeff Spicoli’s classic checkerboard Slip-On goes Pro with the Slip-On Pro ’82. Skateboarders who like Vans' rugged make-up and sticky sole are seen sporting Vans all over Southern California. 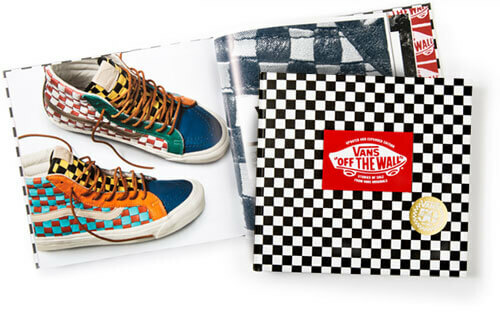 Vans' "Off the Wall" logo makes its debut. Vans #36, the Old Skool, debuts with the now famous Vans Sidestripe. The Old Skool is Vans' first skate shoe that incorporated leather panels for increased durability. What started as a random doodle by Paul Van Doren was originally referred to as the "jazz stripe" and has become the unmistakable hallmark of the Vans brand. 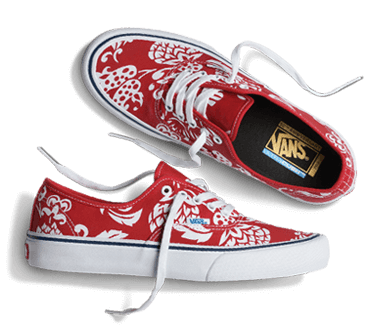 By the end of the 70s, Vans has 70 stores in California and sells through dealers both nationally and internationally. The Sk8-Hi was introduced in 1978 as "Style 38," and showcased the now-iconic Vans Sidestripe on yet another innovative silhouette. As only the second model featuring the recognizable marker formerly known as the "jazz stripe," the Sk8-Hi took skate functionality to the next levelâabove the ankle, where skateboarders used and abused their lower extremities the most. The Sk8-Hi not only shielded bones from skateboards catapulted at them but also brought a whole new look to the park. 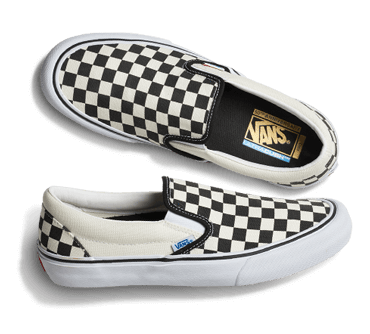 Vans Classic Slip-Ons gain international attention and appeal when they are worn by Sean Penn in the film Fast Times at Ridgemont High. The VansSteve Caballero, the first signature skate shoe, is introduced. The Half Cab went on to become one of the most iconic and culturally significant shoes in the history of skateboarding. Vans sponsors the inaugural Triple Crown of Skateboarding event. Vans launches the Vault by Vans collection, an offering of timeless footwear melding the worlds of high-fashion and premium design to Vans’ classic silhouettes. Today, Vault by Vans continues to forge innovative partnerships, with past collaborators including fashion giants such as Marc Jacobs, and contemporary artist Takashi. Harry N. Abrams publishes "Vans: Off the Wall, Stories of Sole from Vans Originals" which recounts the story of the many action sports legends, artists and musicians who have helped shape Vans as an icon of California culture. Vans opens the House of Vans event space in Brooklyn, NY with music by Public Enemy and a hard charging bowl session headlined by skate legends Tony Alva, Steve Caballero and Omar Hassan. Vans releases its first-ever surf film, "Get-N Classic, Vol. 1" featuring the Gudauskas brothers, Joel Tudor, John Florence and the rest of the Vans surf team. Vans surf program is clicking on all cylinders with the addition of the team's first Australian in Wade Goodall and one of the most exciting surfers in the world, Dane Reynolds. a 3,000sqm art, music and skate space under Waterloo station opens in London’s creative playground. Representing the eclectic diversity of London and the cultures that have embraced Vans from its humble beginnings, through five decades, House of Vans opens with a showcase of creativity. Vans celebrates its 50th Anniversary on March 16, 2016.